The ultimate aim of both science and theology is to understand the ‘source of all’ – and since there can only be one source, then both are seeking to understand the same phenomenon. However, they have approached their task from opposite ends of the spectrum. Theology cut straight to the chase with the belief that God is the source of all and therefore everything that exists emanates from God. Theology views God as a mystery that humans are incapable of understanding and therefore any acceptance of God requires belief. On the other hand science started by gaining and understanding of matter, the earth, the solar system, the galaxies and finally the universe as we know it today. Many scientist believe that the source of the universe is the primeval atom which exploded about 13.7 billion years ago in what has become known as the Big Bang. While the Big Bang is supported by some observations – for example the uniformity of CMB – it is not possible to scientifically prove its veracity. A theory must be validated by experiment and/or observation before it is accepted by science. What was there before God or the primeval atom? I believe that we should first attempt to gain a better understanding of the source and then we will be better equipped to address these questions. Theology can be defined as the study of God and of God’s relation to the world. Based on experience, our understanding of life and existence is of something that changes with time and involves composition. In contrast, theology views God as ‘pure’ which implies no composition; and God ‘always was and always will be’ which implies no change. Therefore God does not live or exist like anything we have experienced and consequently any understanding we may have of God can only be based on analogies. In religious dogma God is most often perceived as the supernatural creator and protector of the complete universe and is usually believed to be omnipotent (unlimited power), omnipresent (present everywhere), omnibenevolent (infinitely good and kind) and omniscient (infinitely wise). The fundamental concept of God employed by the all Christian churches is completely based on the dogma of the Trinity, which declares that in the unity of God there are three divine persons ­– God the Father, God the Son, and God the Holy Spirit; these three persons being truly distinct from one another. While the three persons are distinct from each other, they coexist in unity and are coequal, coeternal and consubstantial. This implies that God the Son and God the Holy Spirit are also eternal, omnipresent, omniscient, omnipotent and omnibenevolent and that all alike are uncreated. This means that there is nothing created and nothing subject to another in the Trinity (no composition), and neither is there anything that has been added as though it once had not existed but had entered afterwards (no change). Therefore the Father has never been without the Son, or the Son without the Spirit. Therefore the Trinity is immutable and unalterable forever. This is the divine revelation regarding God’s nature which Jesus Christ, the Son of God revealed to mankind and which forms the basis of the complete dogmatic system of the Christian Churches. The only possible way that humanity could become aware of such a complex and mysterious dogma is through divine revelation which is God’s word as revealed to us through Jesus Christ and the great prophets. If we reject the concept of divine revelation then we automatically reject the doctrine of the Blessed Trinity. The Trinity is considered to be a mystery of Christian faith. The Vatican Council describes a mystery as a truth which we are incapable of discovering except through divine revelation and which, even when revealed to us, we are incapable of fully understanding. The Christian faith contains many mysteries; however the mystery of the Blessed Trinity is the most impenetrable of all to reason and is beyond the capacity of any created intellect to understand. The mystery of the Trinity was interpreted in Latin theology by St. Augustine (354 to 430 AD) and it later received its final and classical form from St. Thomas Aquinas (1225 to 1274). In the time of St. Thomas Aquinas, the scientific understanding of the universe was archaic, for example scientists believed that the earth was the centre of the universe (the geocentric model). Since then our understanding of the universe has completely changed; however theology has not revised its understanding of God or His relation to the world, to reflect this new scientific understanding of the universe. As stated earlier, theology can be defined as the study of God and of God’s relation to the world – therefore if our understanding of the world changes, then our understanding of God’s relation to the world should change. However theology and science have not engaged with each other, and therefore our understanding of God has not changed since the time of St. Thomas Aquinas. Theology seems to have retreated into a cul de sac and to the safety and comfort of their ‘ivory tower’, from where they pontificate. There is little room for belief in science – a theory must be validated by experiment or observation before it can be accepted by science. The scientific revolution started when Nicolaus Copernicus (1473-1543) published De Revolutionibus Orbium Coelestium (On the Revolutions of the Heavenly Spheres), just before his death in 1543. Since then, scientists such as Kepler (1531-1630), Galileo (1564–1642), Boyle (1627-1691), Newton (1643-1727), Darwin (1809-1882), Maxwell (1831-1879), Curie (1867-1934), Einstein (1879-1955), Bohr (1885-1962), and Feynman (1918-1988) to name but a few, have taken our understanding of the universe to unimaginable levels. By the early 1990s one could be forgiven for thinking that scientists were very close to a complete understanding of the universe. However, in the early 1990s a group of scientists in the USA carried out a study to determine if the universe was still expanding. In 1998 they published their findings which suggested that not only was the universe still expanding – but it was expanding at an accelerating rate. The existence of dark energy is the most accepted hypothesis to explain this observation. While the nature of dark energy is not understood by science, it is believed to be an expansionary energy that permeates the complete universe and makes up approximately 70% of the whole. Dark matter, which is also not understood by science, is believed to make up approximately 26% of the whole. This means that scientists only understand, at most, 4% of reality – which is a sobering thought. While scientists only understand 4% of the whole, they are still continuing their research on the basis that the universe is purely physical in nature. The LUX project in the USA has for the past ten years been trying to find particles of dark matter, and to date they have been unsuccessful. The European Organization for Nuclear Research, known as CERN operates the largest particle physics laboratory in the world. It is understandable and necessary that scientific research should progress in this manner. However, I believe they should also look at other real possibilities. What if Dark Matter and Dark Energy are Non-Physical? Non-physical (or non-physical universe) can be described as everything other than the physical. The non-physical state can be viewed as pre-physical or pre-particle – in other words, the state that existed (and still exists) before elementary particles emerged. The language of physics is mathematics, which can only describe the physical universe. In other words, mathematics must have something (some ‘thing’) to describe – a body, a particle, a wave, a vibration, a string, a membrane etc. Mathematics, therefore, cannot describe the non-physical or pre-particle state – and logically there must be a pre-particle state. It’s a sobering thought that, despite the vast amount of knowledge that scientists have regarding the universe, they only understand (and mathematics can only describe), at most, 4 percent of the whole – the remainder, I believe, is non-physical. If dark matter and dark energy are non-physical; then they are not observable, and do not lend themselves to mathematical analysis. This begs the question – how can they be addressed by science? Scientifically minded people frequently suggest that anybody who supports a non-physical reality rely on blind belief. However, as the old proverb says – too far east is west – and scientists should be careful not to fall into the trap of blind non-belief, which can be described as a refusal to even consider a non-physical reality despite the fact that the science of the physical is unable to explain many phenomena which occur in everyday life. Human mind is the single most powerful aspect of the human condition – yet it does not exist in the particulate state. Emotions, such as love, compassion, empathy, etc do not exist in the particulate state. Telepathy is the purported transmission of information from one person to another (who may be separated by large distances) without using any of our known sensory channels or physical interaction. Many scientists dismiss this phenomenon as pure fantasy, yet they now accept quantum entanglement which Einstein once referred to as ‘spooky action at a distance’. While many reports of paranormal activity are vague, speculative, and based on fantasy, there are many occurrences where paranormal activity is present to the extent that it can be researched in a logical manner. The mindset that the universe is purely physical in nature, which decrees that life is also a purely physical phenomenon. Anybody who genuinely looks at the wonders of life and nature must conclude that there is more at play than a purely physical reality. However science seems to be limited by blind non-belief in anything that cannot be observed or analysed mathematically, with the notable exceptions of dark matter and dark energy. Of course the corollary of point 1 is that if there are non-physical aspects to life, then there must also be non-physical aspects to the universe. 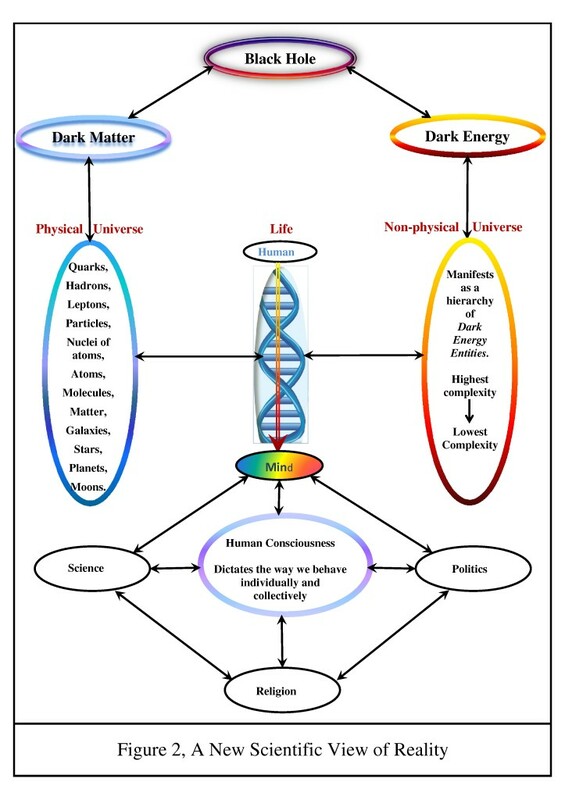 If dark matter and dark energy are non-physical in nature, then the present scientific view of reality, as summarised in Figure 1, is illogical. Figure 2, which incorporates a non-physical aspect, suggests a much more logical view of reality. For details of the scientific arguments underpinning Figure 2 see my blog dated June 9th and titled, A new Scientific View of Reality based on the Grand Interactive Model. How can Science and Theology interact in a Meaningful Way? Figure 2 suggests that the black hole state, dark matter, and dark energy are the source of the universe. However, none of these phenomena are understood by science and they can therefore be described as a scientific mystery. 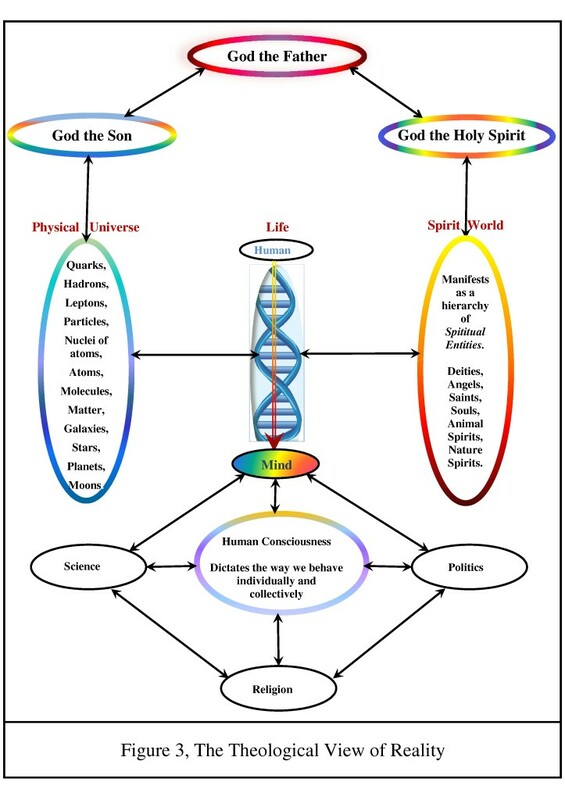 Figure 3 suggests a view of reality that emerges from the theological mystery of the Blessed Trinity. 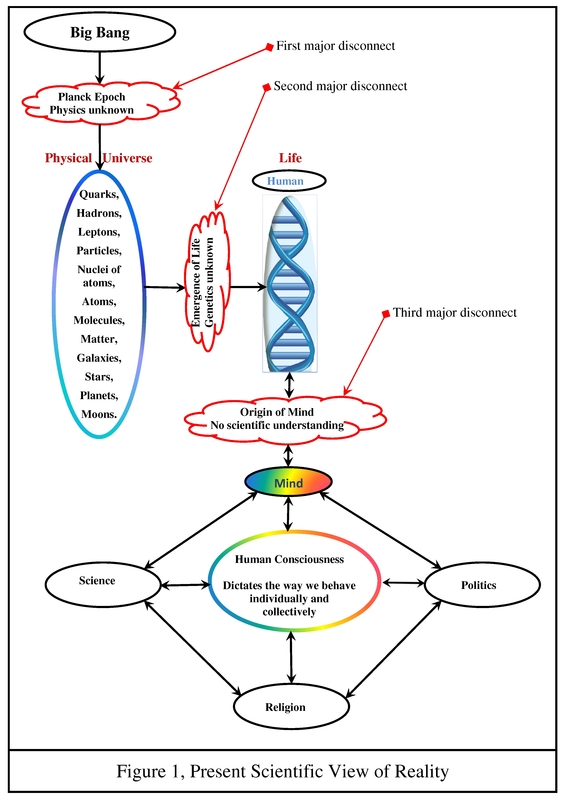 Some time ago I wrote to a professor of genetics in a well known university explaining my belief that there is a non-physical aspect to life. A short time later the professor emailed me back saying “Tom, you believe God made man; I believe man made God”. I was slightly puzzled by his response, especially in light of the fact that there was nothing in my correspondence to him which suggested that I believed ‘God made man’. Around the same time I wrote to a theologian highlighting the similarities between Figures 2 and 3 above. His response was: “I don’t think that God and Dark Matter are at the same level of existence – for Thomas Aquinas, even though of course he didn’t know the data available via modern science, the entire universe (which would include dark matter, etc. ), exists contingently, not necessarily, and that contingent existence requires for its existence a necessary existence”. Again that response puzzled me since nobody knows the nature of dark matter and dark energy and therefore cannot know whether their existence is contingent or necessary. Having spoken to both the professor and the theologian, I know that both are honest, honourable, and intelligent gentlemen who take the chosen profession very seriously. However the two responses demonstrate the difficulty in bringing science and theology to the discussion table, despite the fact that they both are trying to understand the same phenomenon – namely the ‘source of all’. As I have stated earlier I believe that theologians have retreated into a cul de sac and to the safety of their ivory tower. I also believe that unless science acknowledges that there is a non-physical aspect to life and the universe; that they too will retreat into a cul de sac and into their ‘4% ivory tower’. On the other hand, I believe that if science seriously addresses the possibility of a non-physical reality, that it will help humanity to embrace a more enlightened paradigm which will not only change science forever, but will help put an end to all the poverty, starvation, conflict, war, and suffering that afflicts our world at the present time; for the arguments supporting this viewpoint see my blog dated Sept 9th and titled ‘Corruption and Abuse of Power are the Source of all the Major Problems in our World’. 3 Responses to Will Science Retreat into a Cul de Sac – just as Theology did before them? I would be interested in a clarification about FIGURE 2. Marie, thanks for your comment. At present I am writing a blog on complexity which should answer your questions. It will be complete sometime in December. Hope you can wail till then. Hi Tom, I enjoy reading your understanding of consciousness and dark energy. You are not far from the truth. I believe theology and science are in essence one and the same. I did not know about dark energy until just a few years ago, but it explains what I have been trying to formulate to explain how dark energy is the key to understanding the whole controversy about God and why we are here. I have written extensively about this topic. I am almost sure it would interest you in how consciousness and dark energy are interwoven to bring about the impact that we are experiencing in the present. I am currently putting together a book that covers the bible and dark energy and its involvement in this great controversy … from what I have read and heard from your interview excited me because we have similar understanding only I see it from a biblical perspective. Thank you for putting your thoughts on the web and you tube.